Alfred Anderson, a cross guard at Attwood Elementary School, stops traffic to let students cross the street. As the kid approach, Alfred Anderson is ready outside Lansing’s Attwood Elementary School. 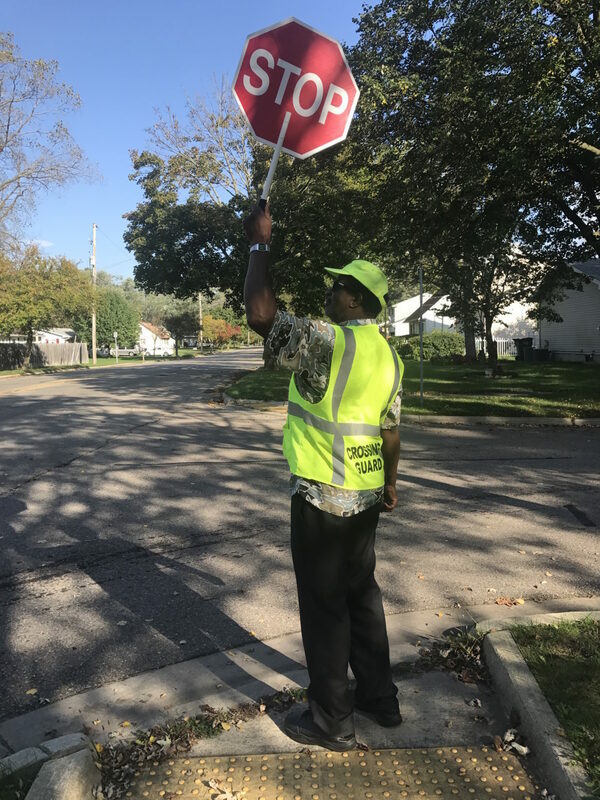 It’s the job of Anderson — and other cross guards across the city — to help students safely cross busy streets on their way to and from school. Being a cross guard requires more than standing outside in the crosswalk when kids come by. It requires attentiveness, focus and caution, said Anderson, who wears a bright yellow bib and is equipped with a stop sign. Effective this summer, the Lansing School District and police department changed their training certification for cross guards in the community. Instead of being trained by the Lansing police, every cross guard received training from All City Management Services, which trains cross guards all around the country. In the state of Michigan, Thomas King is the regional manager. King is completing his fourth year working for ACMS and has been a cross guard for seven years. When speaking to King about the cross guard program, he mentioned the structure and procedures for the attendees. “Michigan has a two-hour training program, which consists of general procedure, assembly and the cross itself. There is a zero-tolerance policy for being late or leaving early,” King said. “There is a field training checklist, which consists of 30 items they go over for every cross guard.” (balance, flexibility, stepping up and down). King also mentioned the guidelines and requirements to ensure the kid’s safety. Tameka Wilson, a parent whose child who attends Reo school, said this new rule was a great idea. Xie Vang, a local parent of Attwood School neighborhood, gave her input on how she felt about newly trained cross guards.